The White House's statement regarding Damascus' alleged "preparations" for the use of chemical weapons in Syria has prompted concerns that it could be followed by a series of US strikes on Syrian government forces. Sputnik contributor Andrei Kots explained why these fears are not unfounded. The White House's recent statement regarding the alleged preparations for the use of chemical weapons on the part of Damascus has prompted concerns among Russian observers about the possibility of new US strikes on the Syrian Arab Army (SAA). 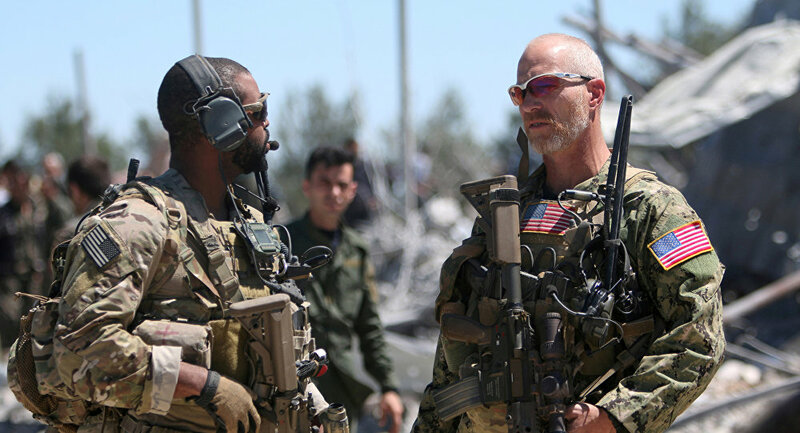 In his recent op-ed, Sputnik contributor Andrei Kots drew attention to the fact that Washington has a long record of launching military operations on false pretexts. "The United States has identified potential preparations for another chemical weapons attack by the Assad regime that would likely result in the mass murder of civilians, including innocent children. The activities are similar to preparations the regime made before its April 4, 2017 chemical weapons attack," the White House's statement said, providing no details to confirm the claim. In response, First Deputy Chairman of the Federation Council Committee on Defense and Security Frants Klintsevich suggested, that the controversial statement means nothing but Washington's own preparations for a new strike on the SAA. "The US is preparing a new attack on the positions of the Syrian troops, this is clear. A new cynical and unprecedented provocation is being prepared," Klintsevich said. The Russian official assumed that the new US attack "would be passed off as a chemical attack" and could be followed by a US strike "on a grouping that is on the verge of a constructive solution of the situation." Konstantin Kosachev, the chairman of the upper house of the Russian parliament's international affairs committee, shares a similar stance. "In any case, it is Washington that looks very unsavory in this story: they either know about the upcoming attack and are not trying to prevent it, but knowingly put the uncomfortable Syrian leader in the wrong for that… Or the United States is preparing its own preemptive strike on Syrian troops and appeals to the topic that is already ‘famous' on a global level and will definitely justify any preventive action," Kosachev said commenting on the White House's statement on Syria. On April 4, the National Coalition for Syrian Revolutionary and Opposition Forces backed by the United States blamed the Syrian government for an alleged chemical weapon attack in Khan Sheikhoun in Syria's Idlib province. Shortly after that, Washington, which had not presented any evidence of the chemical weapons use by the SAA, launched 59 Tomahawk cruise missiles at the Syrian governmental military airfield in Ash Sha'irat on April 7. To complicate matters further, a chat protocol of two American personnel on the ground in Syria provided by Pulitzer-Prize winning journalist Seymour Hersh to Welt Am Sonntag newspaper shows that the US military "knew" that the SAA "didn't conduct any sort of chemical attack." "We KNOW that there was no chemical attack. The Syrians struck a weapons cache (a legitimate military target) and there was collateral damage. That's it. They did not conduct any sort of a chemical attack," one of the US military servicemen wrote. In his recent op-ed Kots emphasized that the concerns voiced by the Russian lawmakers appear to be justified. The image seen round the world of Secretary of State Colin Powell and his mock vial of anthrax,which he held up during a presentation before the UN on Iraq's alleged weapons of mass destruction program, February 5, 2003. "The statements of US policymakers about the use of chemical weapons by [Syrian President] Assad are often being compared with the famous speech of US Secretary of State Colin Powell in the UN Security Council in 2003," the Russian journalist noted, adding that Powell was shaking a small test tube with white powder as evidence that Iraqi leader Saddam Hussein had developed the weapons of mass destruction in his secret laboratories. "[Following this presentation], the US attacked the sovereign state Iraq… and turned this country into a constantly smoldering hotbed of instability in the Middle East. And chemical weapons were never found," Kots highlighted. Before the infamous invasion of Iraq of 2003 the US had bombed Yugoslavia. The so-called "Racak massacre" which took place in January 1999 and claimed the lives of 45 people became the main trigger for the US-led NATO bloc to use force against the Federal Republic of Yugoslavia. However, it still raises a lot of questions about what really happened in Racak on January 15, 1999. The truth of the matter is that the two inquiry teams investigating the incident came to different conclusions, the journalist wrote. While the EU commission insisted that the Serbian security forces slaughtered Kosovo Albanian civilians, a separate group of investigators called attention to numerous discrepancies in the EU commission's story. Citing forensic evidence, the group of Serbian, Belorussian and Finnish experts suggested that the victims could have been Albanian guerillas dressed as civilians. Kots noted that these conclusions were later confirmed by Klaus Puschel of the Institute of Legal Medicine, University Hospital Hamburg-Eppendorf. Needless to say, high-ranking US and NATO officials overlooked the controversy and authorized an all-out invasion of the sovereign state dubbing it a "humanitarian intervention." The Russian journalist offered to go down memory lane and recall the Gulf of Tonkin incident of August 2-4, 1964, which dragged the US into the Vietnam War. Kots pointed out that a Second Gulf of Tonkin incident of August 4 became the major factor that pushed Washington to authorize full-scale military operations against North Vietnam. It was believed that on August 4 more than a dozen of North Vietnamese torpedo boats attacked the American warship USS Maddox in the Gulf of Tonkin. However, as it turned out later, the "Vietnamese advance" was nothing but a false radar image. "Nevertheless, the US leadership used this 'phantom' incident to start a war that lasted for eight long years and claimed more than 1.5 million lives," Kots stressed. The question then arises, whether the White House is going to tread on the same rake again, this time in Syria.